Home / Posts Tagged "Gubbio"
This huge garden, nowadays property of the Province of Perugia, has behind its realization the name and the story of an English woman: Sarah Matilda Hobhouse for whom the love of his husband, the count Francesco Ranghiasci Brancaleoni from Gubbio, lead to the progressive and masterly acquisition of the lands and the vegetable gardens for the realization of the park according to her desires. Sarah Matilda Hobhouse was the daughter of Sir Benjamin, and sister of John Cam, baron of Broughton, minister of the United Kingdom. She grew up in the Duke’s House within the beautiful setting of Whitton Park in Richmond, where she attended his brother’s close friend, Byron, and where she had been courted by Foscolo. 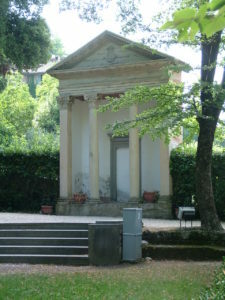 Ugo Foscolo had also sent her a tome of Petrarch’s Rhymes with a dedication to the «Gentile giovine», the kind young; he asked for her hand in 1824, but he received a sharp and bitter refuse from her brother because the poet, exiled, penniless and sick, at the age of fourty-six dared to propose to «one of the prettiest girl in England». Sarah Matilda will marry, three years later, in Rome, the 27-years-old Francesco Ranghiasci Brancaleoni, young, rich and moreover noble. In the same year she was lead in Gubbio by her husband, during the Feast of the Ceri, the city’s most festive time, so she could see the Umbrian town under the best light. Her arrival arose curiosity in the town because the beautiful English girl brought, as a dowry, the huge sum of sixty-thousand ecus. Sarah Matilda should have felt immediately the lack of her beloved gardens, of the colours and the scents of the plants of the English park where she grew; so her husband, since December 1831, began to acquire vineyards, houses, orchards and, within twelve years ,he became the owner of the lands and the tenements stationed along the huge elliptical floors situated in the declining plot of land. 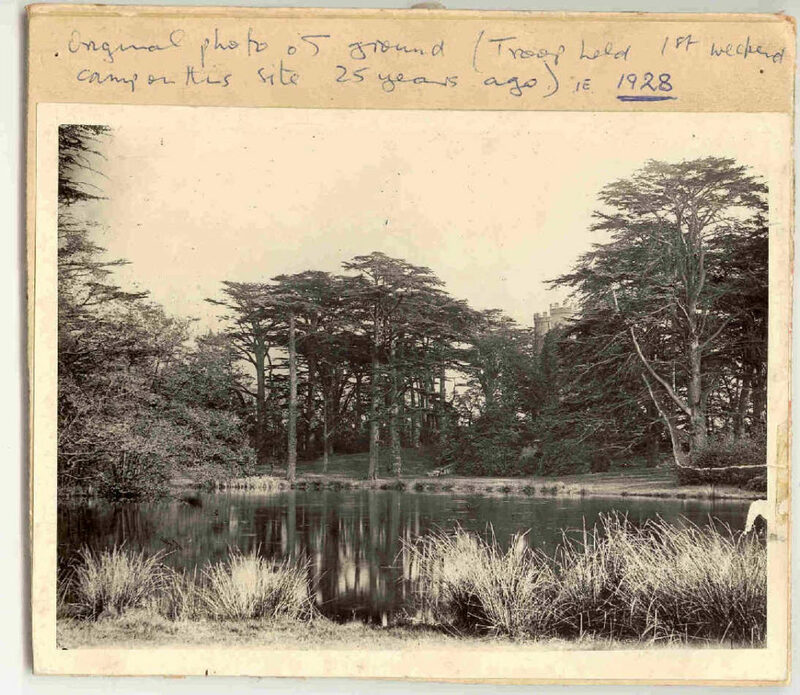 The creation of the park starts between September and October 1841. As it can be read in the memoirs of the Armanni Acreage «it was demolished San Luca’s Church at the ground floor of Rosetti’s house that was the ancient San Luca’s monastery, it was demolished from top to bottom all but the tower that remain standing, although isolated». The testimony is important to understand the modus operandi of the Count that, faithful in his job of realising the so desired park for Sarah Matilda, did not even spare the historical buildings where they cannot be integrated in the comprehensive plan. The works for the fitting-out of the English garden continued until 1848: neoclassical buildings were built between limes, horse chestnuts and oaks and medieval ruins were positioned there. Entering the park from the main entrance, overlooking the actual Via Gabrielli, it is possible, even today, to see two columns that should have been placed near the terracotta statue of a Roman deity, now lost. Through the covered bridge on the creek Camignano, from whose windows can be seen the landscape on the medieval city, we come to the big avenues that walk up the slope creating an ellipsoidal hairpins game. Looking at the city from the boundary wall deliberately not covered by vegetation, Gubbio shows all its undeniable charm. 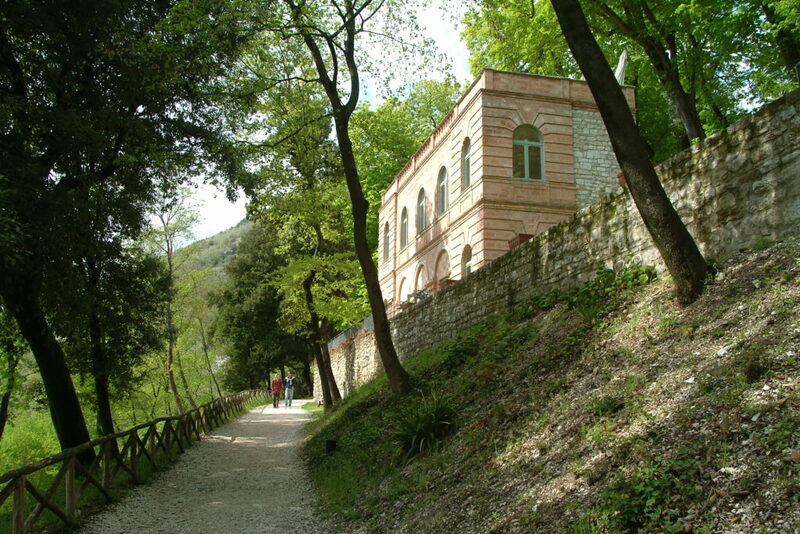 Walking on the hairpins, delimited by different plants that create a yellow and red pattern in autumn, we come up a cottage paved with bricks on example of the scheme of Palazzo Ranghiasci in town. Over there, a fountain, once graced by marble columns, collects water from tanks on the top and channels them towards the inferior hairpin that leads to the most hidden and privileged place of the park; from there it can be seen, in an elevated area, a classical small temple. In the middle of the tympanum there is the coat of arms of the Ranghiasci with their motto «Virtus omnia vincit». 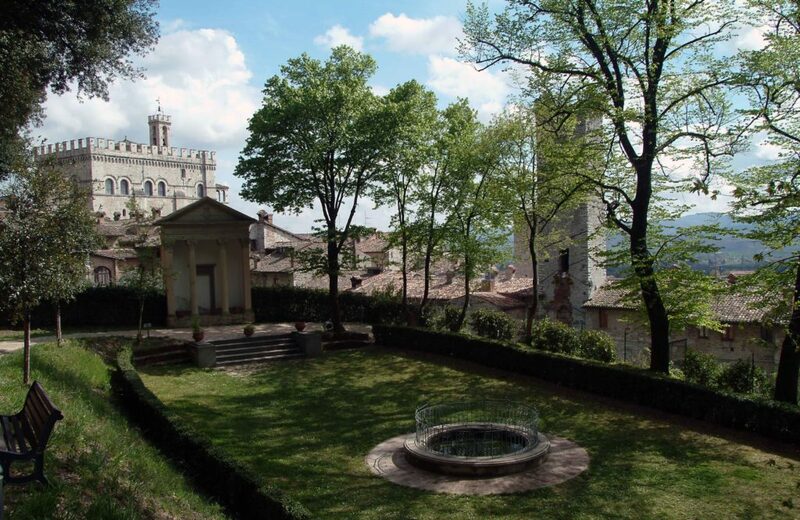 Beyond the temple there is, in a place hidden by trees, the tower of San Luca. There were also greenhouses in the park, where plants and exotic flower were cultivated. A contemporary, Stefano Rossi, decribes the just finished park: «a pleasant grove […] that nowadays is really liked by the touching literature lovers, or by those who love dramatic sensations». This great tribute of love was not enough to let Sarah Matilda enjoy Italy and she did not have a pleasant life in Gubbio: her two children, Edoardo Latino and Federico Latino, died at an early age, she felt melancholic about England and the echoes of her far motherland. She died in England after her comeback together with the daughter, Anne Amelia Latina, in 2 Eaton Square County, Middlesex, a few days after December 9th, 1853, date of her testament. This article previously appeared in «Piano.Forte», n. 1 (2008), pp. 54-55.